Discover great knife throwing ideas, indoor and outdoor target designs and articles from knife throwers around the globe! . We value your privacy. 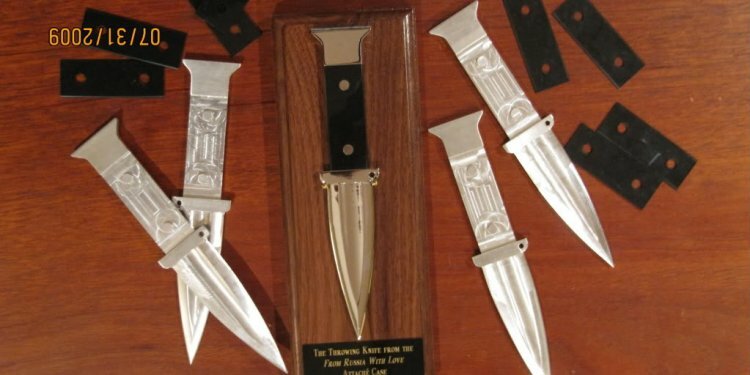 These pages contain Bowie type knives, blade throwers, handle throwers. All basic knife designs. You can get ideas for making your own designs, or you can purchase some of these awesome throwers from our Throwzini Store. They're all great fun! Based on blades thrown by the legendary Jack Dagger. Expertly heat treated and made from a single piece of 1055 carbon steel, this new thrower is perfect for professional and competitive knife throwers looking for big, wide clip point 'Bowie Style' throwing knives. Now available in the "Throwzini Store"! My first Karpie! I won this 12" thrower in an online contest. It was made by Bob "Master of the Blade" Karp! You'll get hundreds of free tips, articles and interviews with the biggest names in the growing sport of knife throwing. A friendly hand shake can get you started! CLICK HERE "... He has so many helpful hints in the video I've watched it 3 times already. Thanks to his guidance and easy to follow instructions, my sticking has improved considerably." FREE STUFF Want hundreds of great knife throwing tips, ideas, articles and interviews with some of the biggest names in the sport of knife throwing?